No but really...I need your help telling me if something is do-able. I'm not an experienced furniture maker-over, but I'm a good learner and I wanna turn THIS ONE PIECE into something magnificent! Don't worry Austin...it would cost less to do it this way and I'm sure you'll appreciate that. PLUS, it'll be fun right? Any advice you can give me would be greatly appreciated. Chablis has already sent me a good long email with tips that I can DEFinitely use. Thanks new fun friend! Go check it out! At Rucker Johns the kids were marvelous. 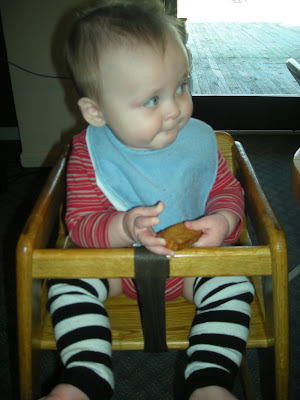 The Leprechaun (thanks for the code name for Izey Summer) ate his toast the whole time without making a peep. 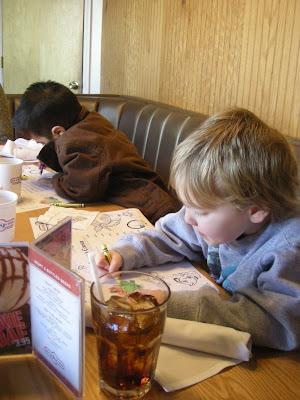 The two sweet boys reverently colored their pictures and would only look up to take bites of their food (which they ate ALL of), smile, or use good manners. Okay no really. The kids were terrible. They screamed and yelled and flopped around like trout out of water. Thank goodness the hostess hid us in the back. Oh and where's Emma-Kay you might ask? Well, we lost her. This is besides the point, but Izey does a new thing that I wanted to share. He makes this da da noise but really hard and holds his breath and gets really mad about it. It's so cute. He also gives a good 'ole belch at the end for ya! where do you get all of his cute leggings? i want some for makena. Ohh what a cutie! So what is the one piece the link wouldn't work? oh my gosh that video was so adorable! I love how angry his da da's get like he is trying soo hard to say what he wants through da da. Love the leggins sooo cute..he is a doll! Oh my gosh I love that video! So what of Linds? Is she in labor or something? Okay, you totally owe me a full tank of gas!!!! Haha! Okay, and I love how Izey Ro is trying with all his might to get "dada" out! And of course, his burbs to follow! What a man already! i love the vid of izey...too cute!! I love all of Izeys legwarmers! SO cute! Anyway, sounds like the lunch date was a success... no gastrointestinal distress, just some rowdy kids. All in all... an improvement for you two! i think i heard a belch AND a fart there at the end. Gosh i wanna eat him. I love his roundy face... it's just so delicious. LOVED the video:) I need to video L more...it just captures things a picture can't! Izey is a superstar! Too cute. I want to eat him too. Bacon salad sounds delish. I want some!